Bryan Wilson (second from left), Vanessa Hammler Kenon, Ed.D. (third from left) and TASSCC board members celebrate UTSA's 2018 Project Excellence Award. (Aug. 8, 2018) -- The UTSA Office of Information Technology (OIT) has received a 2018 Higher Education Project Excellence Award from the Texas Association of State Systems for Computing and Communication (TASSCC). The honor recognizes the impact of OIT’s Academic Support Solutions Fund in contributing to stellar collaborative achievements within the university community. UTSA was one of four recipients for this year’s Project Excellence Award, which honors higher education institutions and government entities that have demonstrated outstanding information technology accomplishments. Established in 2016, the OIT Academic Support Solutions Fund provides support to UTSA departments in implementing student-centered projects to boost student success. Since its inception, OIT has awarded more than $200,000 to various UTSA colleges and departments. That funding has helped UTSA create a digital humanities laboratory, refresh its computer labs, upgrade its computing infrastructure and purchase state-of-the art technology and software. These implementations are geared toward enhancing students’ academic and research pursuits at the university. OIT extends a call for proposals to all nine UTSA colleges through its Faculty Advisory Committee at the start of the academic year. The call remains open through October of the given period; award recipients are announced in November. TASSCC’s 2018 recognition is UTSA’s second in the last six years. In 2012, OIT received a Higher Education Project Excellence Award for its InSight application, an information resources reporting tool. 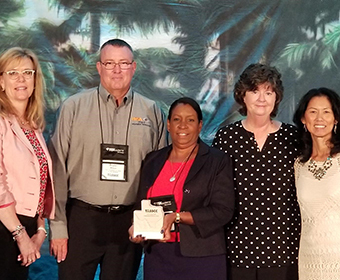 Wilson and Kenon accepted UTSA’s 2018 Project Excellence Award at the TASSCC annual conference awards luncheon on Aug. 7 in The Woodlands, Texas. Learn more about the UTSA Office of Information Technology, its Academic Support Solutions Fund or its Faculty Advisory Committee.